My area is very broad as I have professional staff members in Coeur d'Alene, Lewiston, Sun Valley, Twin Falls and me from SW Idaho covering much of Eastern Oregon in Ontario, Baker City, La Grande and Northern Nevada in Winnemucca, Elko, Reno including the Lake Tahoe area. Central & Northern Utah and Western Wyoming. If we have to get on a plane to fly there, we'll do it. At least one of my staff members is always on call 24/7. Never delay on contacting me about a recently lost item, many people are not honest, weather can change or hide something and a lawn mowing can also damage or remove a freshly lost piece of jewelry. I work on a reward basis, pay me what it's worth to you and what you can afford...Only if I find your lost item. There will be a charge to cover my gas cost to get to you if the item isn't found. Call to discuss. Recover of lost jewelry, property markers, keys, wild game cameras, hidden coins, gold nuggets, bars, shooting arrows, hearing aides, guns, bullets/casing from crime scenes, items from house fire, flash flood, insurance claims and or anything made of metal that has value both sentimental and monetary. We hunt land and water with one of the staff members being a certified diver. All hunts on private property must be with permission and I can help you get it if need be. Gerry grew up in the beautiful outdoors of Idaho. He is a US Marine Corps Veteran who stole the Colonels daughter 25+ years ago and still hugging her today (Semper Fidelis - Always faithful). As a young boy he started metal detecting in 1972 and has been using a variety of brands and models for the task at hand all while trying to keep a smile on other peoples faces when he returns another item. 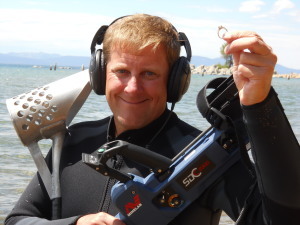 His business Gerry's Metal Detectors, of 20+ years is very well known in the metal detecting industry as the premiere dealer on Field Training Metal Detector classes. Gerry & his staff work with the majority of brand name metal detector manufactures testing many of the detectors before they hit the market. Adventure is what Gerry enjoys most and he also has put together many metal detecting trips across the US, England, Mexico, Bahamas and even ventured into Australia. His numerous YouTube videos (Gerry's Detectors) are both educational and inspiring as he has recovered numerous amazing finds in his 40+ years of detecting. His field use of detectors has allowed him to realize with almost 100 models to select from, some of them are designed for certain targets/terrains/tasks and to get best results he needs more than one. Gerry certainly does and his success with a variety of land and 100% waterproof detectors proves his detecting knowledge is tops in the industry. Some of his higher end equipment even has GPS capabilities when needed. Some of the items he has been involved with in search and recovering a high percentage. Lost rings are most often the case with some videos and many Facebook posts showing returns. Finding a stud diamond ring is one of the hardest to accomplish (with very little metal at all) but he has managed to recover and return 2 of them from separate hunts, to the ladies in distress. Other examples of his work. CB radio the Fish & Game lost in the woods. Archery bow fell off a boat and lost in the river, a couple different hearing aides, buried and or hidden caches of silver dollars and gold coins is always exciting. Property marker for house sites and land. A sterling High School bracelet that was lost 20 years prior and many other items of sentimental value. One of the highlights of Gerry's detecting career was being in the 1st group selected to work side by side with archeologists at the 4th President of the United States, James Madison's estate in Montpelier, VA. Honesty, integrity and trust are key contributors when handling artifacts of such significance and historical value. There are no guarantees in life, but if you call now we can get started in trying to put a smile back on your face. Personal Treasure Related Websites: www.gerrysdetectors.com and go to videos. Also follow him on Facebook at Gerry McMullen.